The fantastic examples in this segment make the mouth water for ownership of one each! Nothing is any more spectacular than great Imperial purple, their pumpkin marigold, with an example of Teal for added glamour! Blue Imperial is “something to behold”! Often referred to as “blue-violet”, there is no mistaking the strong evidence of blue base glass. The “violet” attribution no doubt derives from the heavy overlay of exterior purple iridescence. 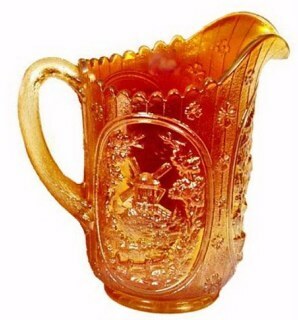 Full size Water Pitcher in FOUR-SEVENTY-FOUR pattern seen in Imperial Catalog # 104A. Courtesy Don & Lynda Grizzle. 474 Tumblers- 4.5 in. tall. 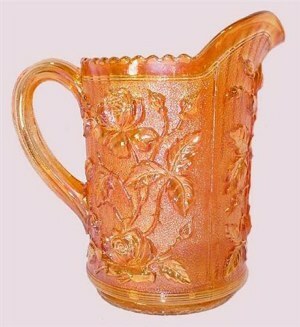 FOUR-SEVENTY-FOUR: The Marigold water pitcher is 9 7/8” tall w. base of 5 1/16”. The tumblers are 4 3/16” with a base of 2 5/8”. This water set is also found in emerald green, helios and rare purple. The lovely example displayed in purple has measurements of 10” from base to highest point of the lip's side, a 5” diameter base, and 9 ¼” from base to handle's highest point. 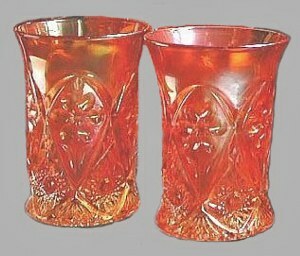 LUSTRE ROSE-Standard Set: Two versions exist in this water set pattern. 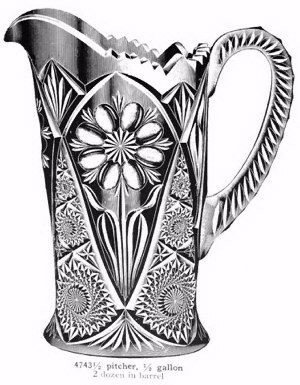 This standard type offers the ribbed interior on both pitcher and tumblers, along with a rayed star molded into the base. Marigold is easily found, along with helios. However, the spectacular sets, usually having electric iridescence, are considered very rare. (Please refer to ~~ ~~ in our Alphabet for a view of one such set). Relatively few rich amber sets are to be found. Standard tumblers known in aqua and olive colors, with no ribbed interior pitchers yet confirmed in those two colors. LUSTRE ROSE Variant: The Lustre Rose Variant water set has plain interior and a plain base. The water pitcher has been confirmed in only two colors: marigold and clambroth. Variant tumblers have been documented in marigold, clambroth, aqua, light blue with marigold overlay, lime green, and a true, frosty white. As you may have surmised, the Lustre Rose Variant items are much more difficult to locate than the Standard versions. 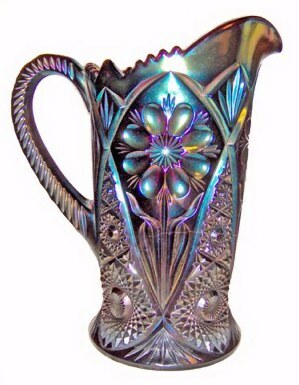 WINDMILL Water Set in Blue: Wonderfully iridized examples in this familiar pattern are always desirable, especially in purple. Emerald Green water sets should be considered “prizes”, along with smoke examples. Rarer still , the cobalt blue water pitchers and tumblers eclipse all other colors, with only a few known. The term blue-violet used in reference to the blue pieces is somewhat a misnomer, in that it is the heavy purple glaze treatment used in iridizing purple examples in this design, which offers that violet appearance when holding the blue base glass to the light. This particular pitcher was listed on an auction brochure as purple. 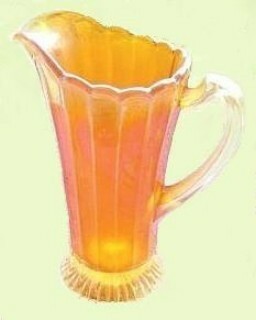 Many people did not bother to check the glass color against daylight, so a $1400 pitcher was purchased for considerably less. Blue examples from Imperial are as blue (base glass ) as any blue glass from Dugan, Northwood, or Fenton. 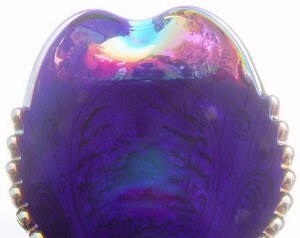 It is the heavier purple influence of the iridescence applied by Imperial which creates the confusion. Look closely at the tumbler sitting next to that blue pitcher. It IS purple base glass! 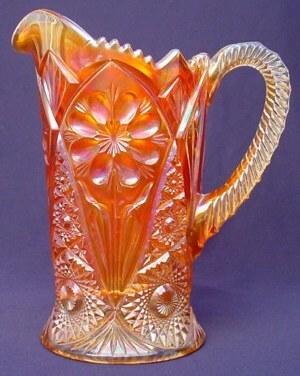 A one-pint milk pitcher is known in this pattern, with available colors being: marigold-found most often, purple-rarely found, along with helios, clambroth and smoke. NOTE: Smith Glass Company reproduced many of the Windmill molds. They are marked with the S within a circle. Colors of the new carnival Windmill pieces include red, pink, vaseline, blue, and green. 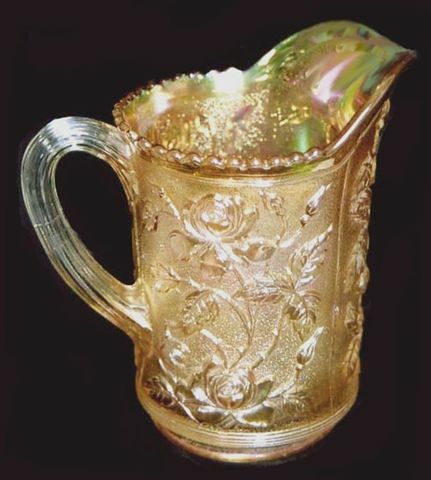 GUNMETAL or BRONZE-experimental WINDMILL water pitcher-Sold 2-06 for $250.-Remmen Auction..
WINDMILL Water Set in Marigold: This is the most widely seen color, with helios examples following in availability. Tumblers are available in the additional colors of aqua, teal, lavender, and olive, all of which are simply variations of the basic colors of green and purple. 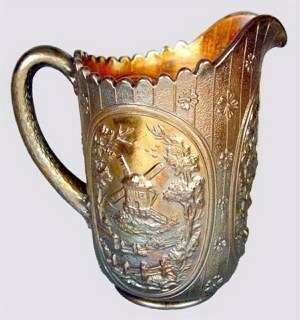 WINDMILL Water Pitcher in Bronze finish: When Debbie Remmen and I discussed this pitcher prior to its sale in the Tampa Bay Convention Auction in 2006, she called it Gunmetal. The precise color of this very unusual, heavy overspray is all in the eye of the beholder, to be sure. Terminology in discussing this quite unusual pitcher must include the word “experimental”, however, because in all our combined years of looking at dozens of Windmill pitchers, we have never seen another like this! 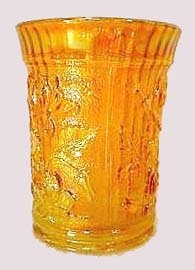 PILLAR FLUTE Water Pitcher: Marigold and Clambroth are known colors in this evasive pitcher, along with tumblers in those colors which are perhaps better described as virtually extinct! The pattern has been called Lustre and Clear. However Pillar Flute is the pattern name applied to its original listing in old Imperial factory catalogs. It was given the designation number 682. The water sets are extremely scarce. 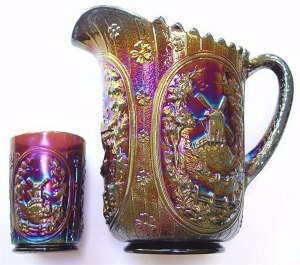 More than 30 shapes were produced in non-iridized crystal, but only about half that number are found in carnival glass.